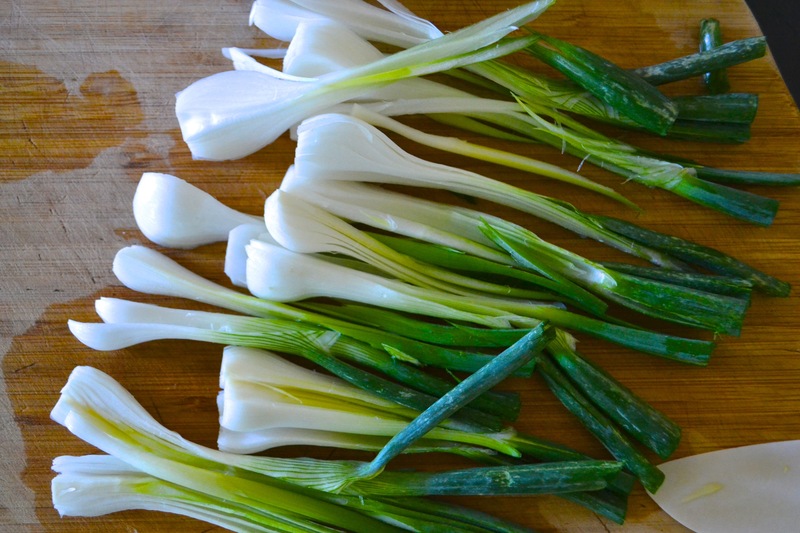 I simply can’t get enough of the sweet and flavorful young onions I’ve been picking off the farm featured in last week’s post. So each week I must devise yet another way to use them as I literally have bags of them stuffed into my refrigerator. One Sunday while we were visiting the farm, a local chef served up a delicious hash using two or three different vegetables from the fields around him. It inspired me to cook up my own, which I’ve been doing every week now. Serve the hash on it’s own with a little hot sauce, such as Cholula, or add a fried or poached egg on top for a hearty, healthy and savory breakfast. 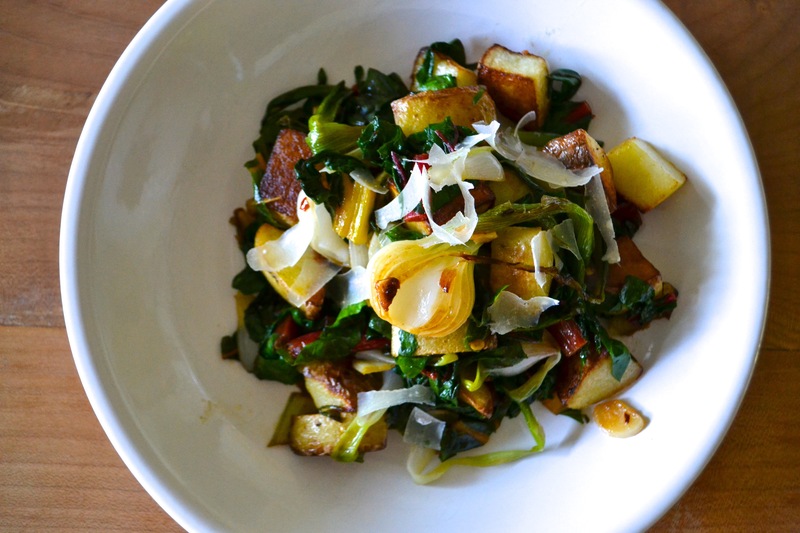 This hash also makes a great side dish to sausage or grilled meat or fish. We’ve been eating it on it’s own when we’ve had a busy day or a late lunch and simply want a light, vegetarian dinner. You can, of course, substitute in any number of vegetables. 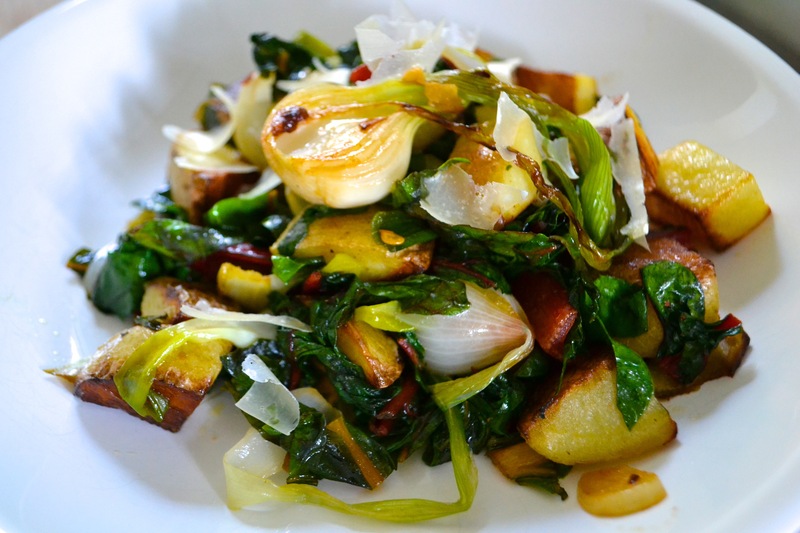 I think curly kale would work especially good as a substitute for the chard I’ve been using, and I make this dish using cremini mushrooms and cherry tomatoes as well. Heat a large cast-iron skillet over medium-high heat. Swirl the oil to coat the bottom. Add in the potatoes and cook until still firm but tender and lightly browned. (I use a fork to test doneness.) Using a slotted spatula, remove the potatoes to a bowl temporarily. Lower the heat to medium-low and add in the garlic and onions. Stir until they start to soften. Add in the pepper flakes and chard and cook until wilted. Add in the potatoes and cook until they’re warmed through. Divide onto 2-3 plates and sprinkle with the cheese, if desired.